Get the pop of color you want with a romantic twist! 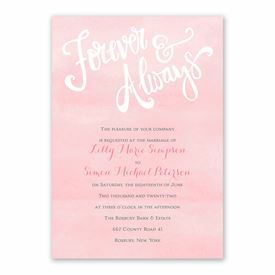 The Forever and Always Wedding Invitation features a watercolor background in your choice of color as well as "Forever & Always", "Reply" and "Celebrate" in a bold and charming font. These two-sided wedding invitations are printed with your invitation wording on the front and your choice of wording on the back (reception details shown). Response postcards are included and matching information cards are available. Personalization Options: "Forever & Always", "Reply" and "Celebrate" are printed as shown in your choice of color. The watercolor background is printed in your choice of color. Your wording is printed in your choice of colors and fonts.